What should you do when you receive a lay-off notice? What's the best way of surviving a layoff? How should you handle being unemployed? If you've lost your job, you're not alone. There are always companies that are cutting jobs or restructuring operations. It's a normal part of conducting business in today's economy. Even when unemployment is low, organizations continue to streamline their workforce; there are industries that are losing jobs, and industries with wage stagnation that are in decline. How can you tell if it's going to happen to your job? Before the official notification, rumors of downsizing often run rampant through an office, so that employees might be somewhat prepared for a lay-off announcement. In other cases, the news is a surprise — you're shocked, unpleasantly astonished, and not at all sure what to do next now that you're unemployed. 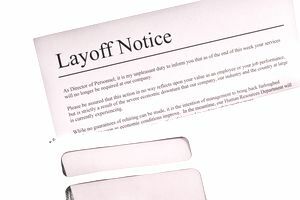 How should you handle it if you're the recipient of a lay-off notice or if you lose your job without prior notice? First and foremost, you should check with your company on the benefits you might be entitled to when you leave. It's important to be informed about your employee rights, so you are clear on where you stand when you lose your job. Then, it's important to file for unemployment insurance and to make sure you have all the bases covered so that you can start a job search. You may, however, be able to turn a layoff into a new career. Here's how to handle unemployment, start a job search, and more advice on what to do when you lose your job. If you do have an inkling that there's going to be bad news, be prepared to ask what benefits terminated employees are eligible for. Ask about severance pay, accrued vacation, overtime and sick pay, pension benefits, and eligibility for unemployment insurance. If you lose your job through no fault of your own, and you meet the eligibility requirements, you should be entitled to receive unemployment compensation. Severance packages might be negotiable. You have nothing to lose by asking for more than what's offered. Request information on the continuance of health and life insurance benefits. If your employer has more than 20 employees, they are mandated by law to offer health insurance coverage through COBRA to terminated employees for at least 18 months. However, it is worth asking if you would be covered for a certain period of time at no cost to you. Health insurance is also available through the government's health insurance marketplaces. Here's information on COBRA vs. Marketplace (Obamacare) Insurance. Check on options for handling your 401(k) or company pension plan. Ask about outplacement resources — some companies provide job search assistance. Request a reference letter for your files. An important task for those unemployed, and for all job seekers, is to plan your job search. Before you can implement the plan, however, you need to take care of the basics. The most critical issue, in most cases, is income. Contact your state unemployment office as soon as you can to determine if you are eligible for unemployment benefits. If you can't make ends meet — and many of us can't — on an unemployment check, consider freelancing, taking a temporary position, or lining up some gigs to supplement your income. Don't be proud. Your temporarily reduced circumstances might entitle you to food stamps or other government benefits. Remember, you paid for those benefits out of every paycheck you've earned. Your state's social services department can inform you what assistance you qualify for. If you are a member of a church, ask if there is any help available. Community organizations often have resources to help the unemployed with food baskets, donations, and babysitting. Community resources are also available to help with the mechanics of your job search. Many state employment services and public libraries have internet access as well as access to software and printers to help you produce a resume. They may also have counselors who can provide assistance with writing a resume and cover letter and finding a job. Here's how to utilize your local library when you're job searching. Refocus your energy and use this unexpected windfall of time as an opportunity to reassess your career goals and to get on track and find a new position. Many job seekers have turned a termination into a positive experience. A forced departure from a job has often opened a path to a new, more satisfying, and better-paying career that wouldn't have been considered under other circumstances. Review these ten steps to find a new job, including where to look for jobs, the top job sites, how to use your connections, how to ace the interview, and how to follow up. How long will it take to line up a new position? There isn't an easy answer. If you've got in-demand skills, it might happen very quickly. If not, it might take longer to find a new position. If it's taking more time than you thought, don't be discouraged. There are strategies you can use to turn your job search around even when nothing seems to be working. Finding the right job can take time, but it will happen. Do your best to keep it positive while you're looking for the next step on your career path. Does an Employer Have to Provide Notice of Termination?